This is why the birdhouses in my yard are just for decorative purposes. The squirrels chew them all up. Mostly enlarging the holes, but also chewing up the sides and tops too. With these large holes, no birds would ever nest in one. I remember being an avid birdhouse collector. I think it was in the late 1980's and early 1990's. I had quite a big collection of birdhouses mostly purchased from country craft sales. They were pretty "cutesy" with lots of hearts. Now I go for a more "rustic" look in birdhouses. 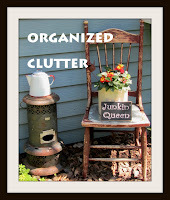 Birdhouses for junk gardens. Like these three that I display on a potting bench in the back yard. This star birdhouse on a stake is from a craft shop. I stick it in the ground in front of the house. It's borderline "cutesy" but more towards primitive. This blue birdhouse "condo" is for decorative purposes only, and gets a lot of attention in my front flower border. 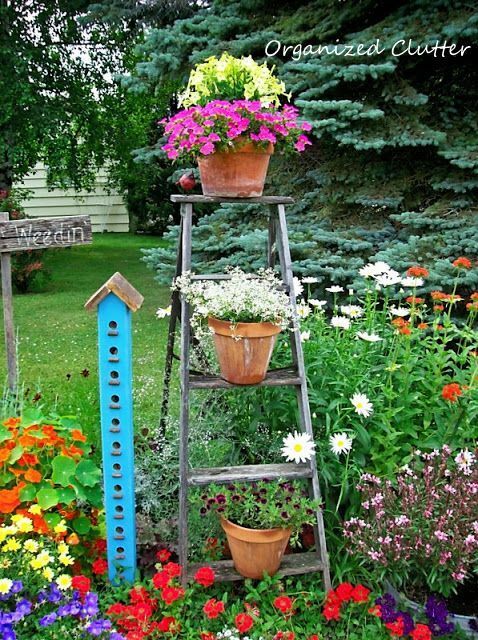 This little galvanized birdhouse is a flower pot pick that I stuck in with the sunpatiens this summer. We feed the birds, probably why we have soooooo many squirrels. This is our thistle or thistle mix feeder. Usually filled with yellow finches but not today. This black oil sunflower feeder has been battered, tipped and chewed on daily by the squirrels. 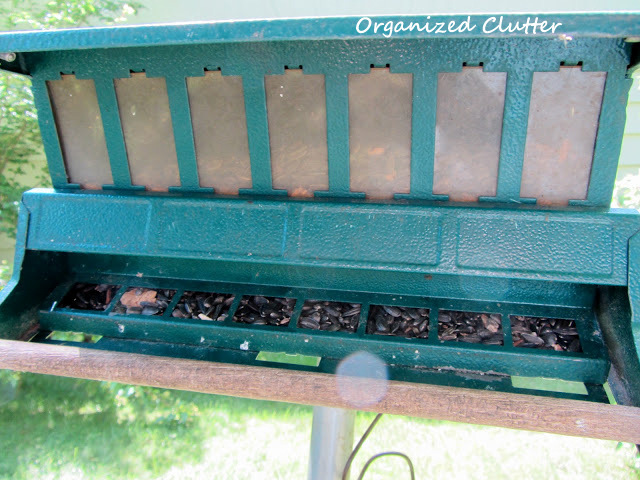 And no feeder is "Squirrel Proof" even if they say they are! This is our suet feeder. 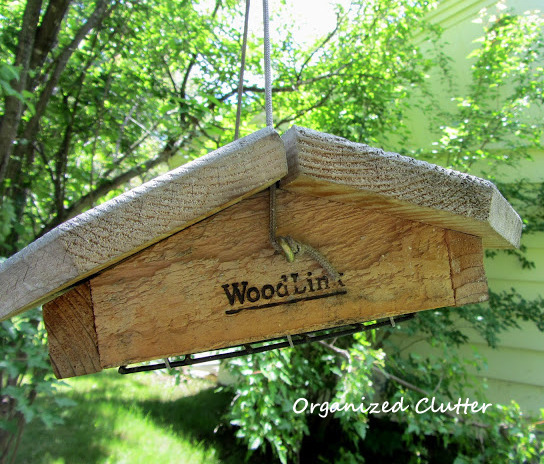 It is designed to keep the grackles and larger birds off. And this blue glazed, terra cotta birdbath one on an upside down terra cotta pot. The smaller birds like this one by the deck. Do you feed the birds? Do you have a squirrel problem too? 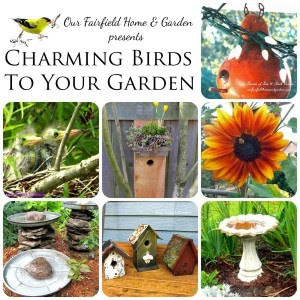 Click on the link to see more photos and posts on our feathered friends from the Garden Charmers. I love all your birdbaths. I am glad I don't have squirrels. When we had the same problem with critters nibbling the holes in our many birdhouses, my hubby bought 3x3" squares of heavy plexiglass and then used a hole driller to drill the appropriate size hole in each for the desired bird. He secured these to the outside of the houses (covering the "badly chewed holes"). They, of course, don't exactly "blend in" with the natural woods, but the critters never again gnawed the holes and birds, once again, gladly accepted the birdhouses. You have so many gorgeous birdhouses! I love the way you have them displayed around the property. No squirrels, my cat sees to that. I do feed the birds...but right now I'm battling a raccoon who had decided to eat all of my bird seed...any tips for those nasty things?? 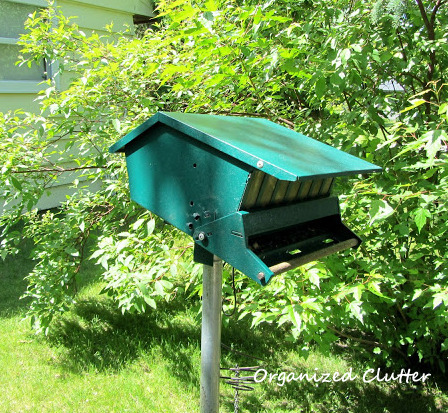 The little galvanized feeder is my favorite! When we tried to feed the birds, at first it was really fun but then....a bear got to the feeder and ripped it off the tree and took a big chunk of the tree off. That was the end of that! Good post. Squirrels seem like the most common form of destruction in bird feeders. Thanks for the post.